Early American automobile maker. Imported into UK by H. H. Chipman. 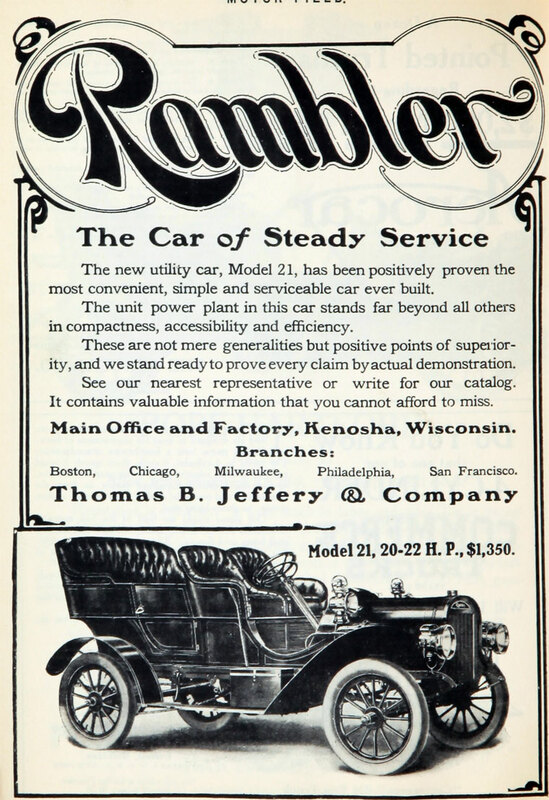 Rambler experimented such early technical innovations as a steering wheel (as opposed to a tiller), but it was decided that such features were too advanced for the motoring public of the day, so the first production Ramblers were tiller-steered. Rambler innovated various design features and was the first to equip cars with a spare wheel-and-tire assembly. This meant that the driver of a Rambler, when experiencing one of the all-too-common punctures (flat tires) could simply exchange the spare wheel & tire for the flat one. Previously it had been necessary to remove the wheel from the car, demount the tire, patch the inner tube, re-mount the tire, inflate the tire, and re-mount the wheel. The interchangeable wheel and a spare tire made travel a lot easier on primitive roads that were littered with stray horseshoe nails. The punctured tire could then be repaired at a more convenient time and place. 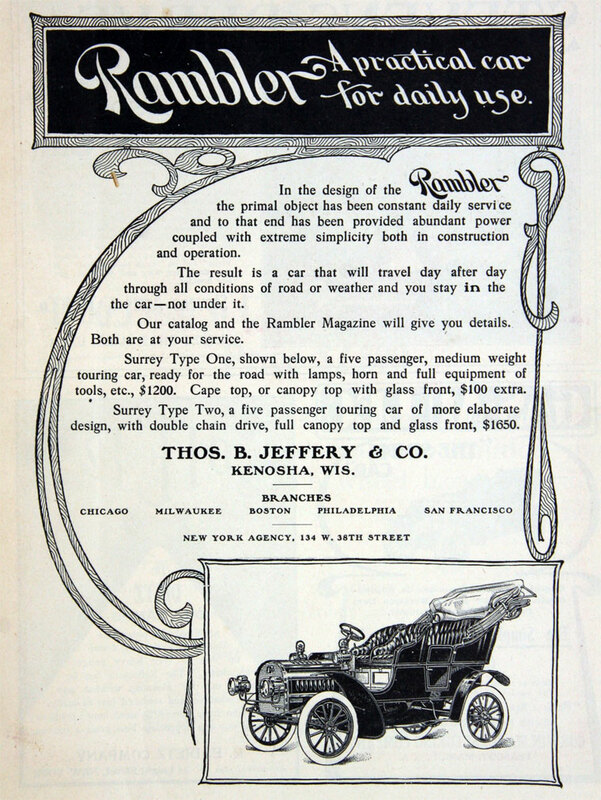 1914, Charles T. Jeffery, Thomas B. Jeffery's son, replaced the Rambler brand name with Jeffery in honor of his now deceased father. 1916, the Thomas B. Jeffery Company was purchased by Charles W. Nash and became Nash Motors Co in 1917. 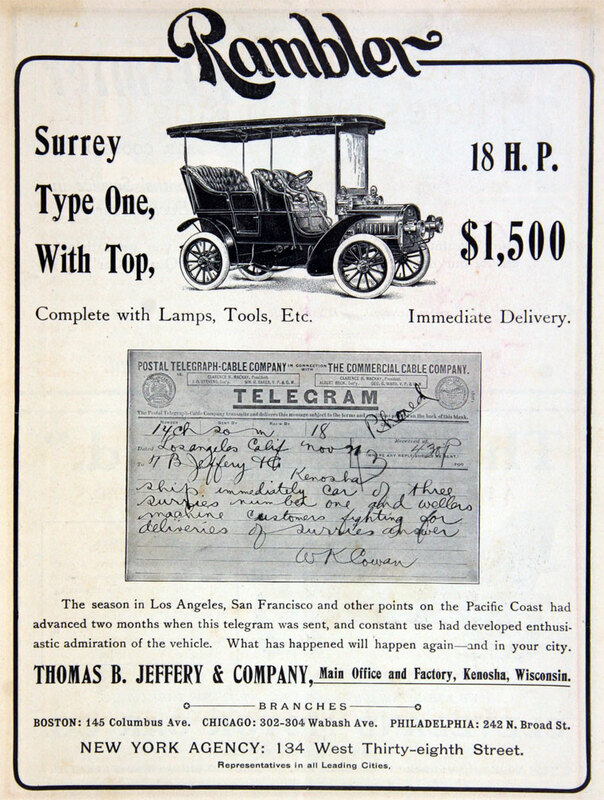 The Jeffery brand name was dropped at the time of the sale and the manufacture of Nash branded automobiles commenced. 1937, the concern became the Nash-Kelvinator Corporation through a merger with the well-known appliance maker. This page was last edited on 20 June 2012, at 15:34.